You may well know the story of how the Razorbacks got their name in 1909 from then-football coach Hugo Bezdek, but it was still a few years before the school mascot was first depicted. The Razorback logo was adopted in fits and starts by various university groups, appearing first on the “Rootin’ Rubes” female pep squad uniforms in 1911. A version appeared on the baseball team uniforms in 1913, and in 1916, the university yearbook transitioned from the Cardinal to the Razorback. 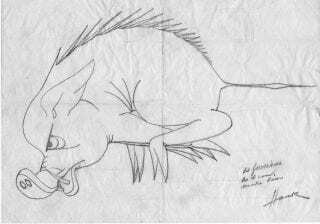 The first widely adopted depiction of the Razorback was the “Running Razorback” drawn by Hank Hancock in 1924. It soon became the de facto emblem of the university while also becoming the unofficial logo of several businesses in Fayetteville. 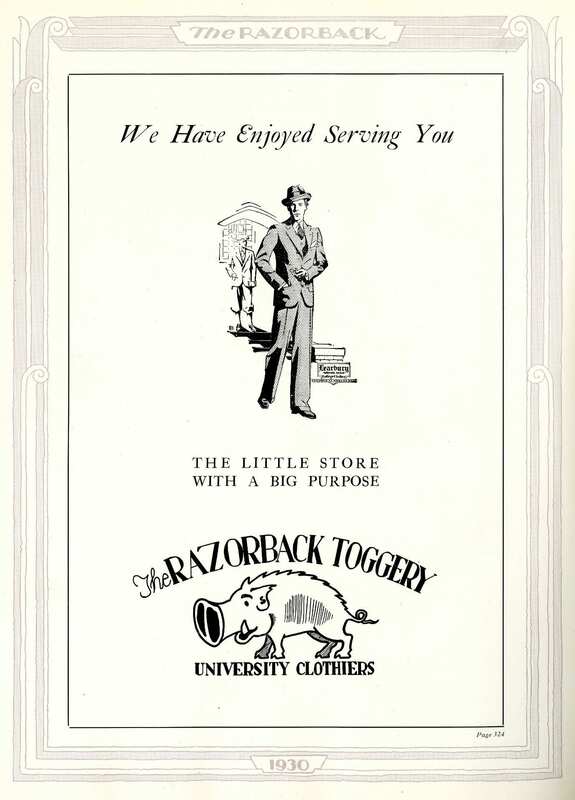 According to Hancock in his book A History of Arkansas Razorbacks, and as demonstrated in yearbook advertising, the logo was quickly adopted by the Price Clothing Company and Tony’s corner store in Fayetteville to help draw in the university population. In the following years, businesses began using both Razorback and Hog in their names to increase their patronage. These businesses ran the gamut from restaurants to dry cleaners to merchandise stores. Examples include the Razorback Toggery, a clothing store marketing directly to university students in Fayetteville, the Razorback Sandwich Shop (1926), Razorback Cleaners (1955), Hog Wash Laundry (1980), Razorback Beauty Supply (1980), and Razorback Travel (1980). 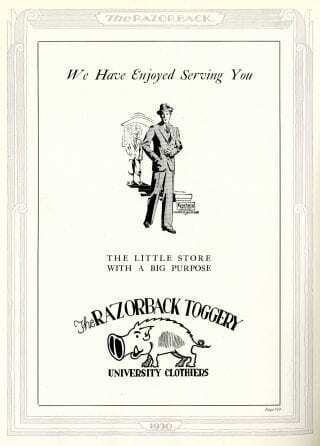 These businesses were located all throughout Arkansas and were able to use the Razorback name and logo because at that time, the university did not have a trademark or copyright on any of the words, phrases, or logos associated with the Razorback. This lack of trademark and copyright led to a proliferation of Razorback merchandise unassociated with the University of Arkansas. A wide variety of items came on the market over the decades: t-shirts, sweatshirts, ashtrays, notebooks, shoes, clocks, baby bibs, et cetera. One iconic piece of paraphernalia is the hard-plastic hog hat known as “Uncle Heavy’s Hog Hat.” This piece of headgear was created in 1969 and quickly became a favorite among Hog fans. More unsavory uses of Razorback imagery also existed. There were various alcoholic beverages: beer, wine, and whiskey. In 1961, the university attempted to persuade the whiskey distributor to cease sale of the Razorback whiskey, which ultimately ended up in a court challenge. The university lost that challenge due to the use of the word “Razorback” by several other businesses. Another questionable item on the market were “Razorback Reds,” a Hog branded condom. The emblem was also used by the religious group ISKON (or Hare Krishna), which sold bumper stickers at an Arkansas football game bearing the Razorback emblem. In 1987, the university decided to act and file for trademark on several pieces of intellectual property. The U of A worked with Collegiate Licensing Company (now IMG College Licensing) to register three styles of running Razorbacks, two designs with Hogs and the capital letter “A,” the name “University of Arkansas,” “Razorback,” “Razorbacks,” “Arkansas Razorbacks,” “Hogs,” and “Go Hogs.” The University invited businesses already using these trademarked words to negotiate agreements with them, and it appears as though many did. The cheer of “Woo Pig Sooie” was added to the roster of University trademarks in 2014. Sadly, negotiations with the creator of “Uncle Heavy’s Hog Hat” fell through, although a similarly designed and officially approved hat remains on the market. 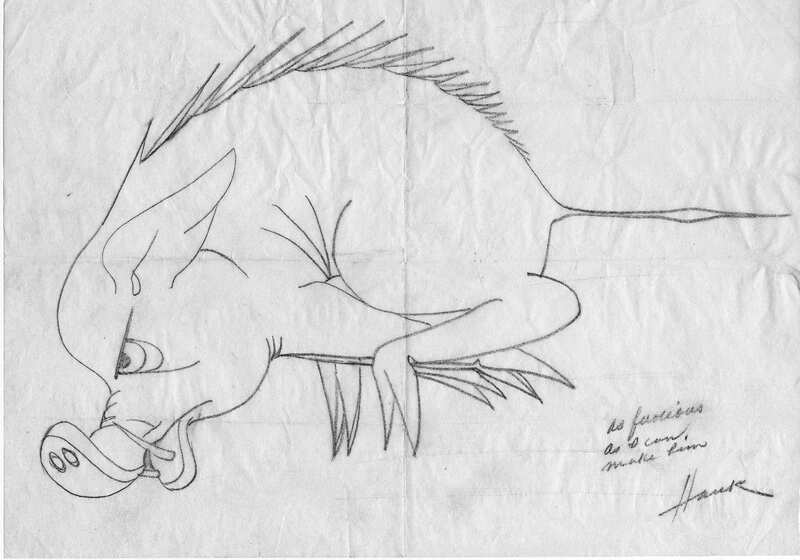 For more on the history of the Razorback mascot, look at this blog post by Amy Allen, our university archivist. For more information about the public domain and copyright, see our latest digital collection, A Belated Gift – U.S. Copyright and the Public Domain.